Snapchat has recently been hitting a lot of rough patches. It’s brand new redesign that Evan Spiegel was so proud of has been bashed by a lot of people, and then the company received widespread backlash after posting a controversial ad that was insensitive to victims of domestic abuse. As a result, a lot of users have uninstalled Snapchat, with major celebrities like Kylie Jenner also publicly denouncing the popular ephemeral messaging app. However, it seems like Snapchat is trying to regain some of its lost charm by hosting a special kind of activity. The company has launched a virtual easter egg hunt that will be held in the app’s ‘Snap Map’ and will have users going to public places like malls, airports, parks, and other locations in search for easter eggs. This decidedly Pokemon Go-ish activity is designed to get people to open the app again, and also to (hopefully) get them to spend some long hours on the app, looking for eggs to collect. People will get points for the eggs they find, and the lucky few who find rare, golden eggs, will get 5 points for them. The eggs aren’t removed from their spot once a user finds them, so people can go egg hunting with their friends without having to fight for catching eggs — that’s definitely a nice touch, although I sort of see Tumblr and Reddit posts cropping up with details of where to find eggs in different areas… that’d be cheating, folks, so don’t do that. 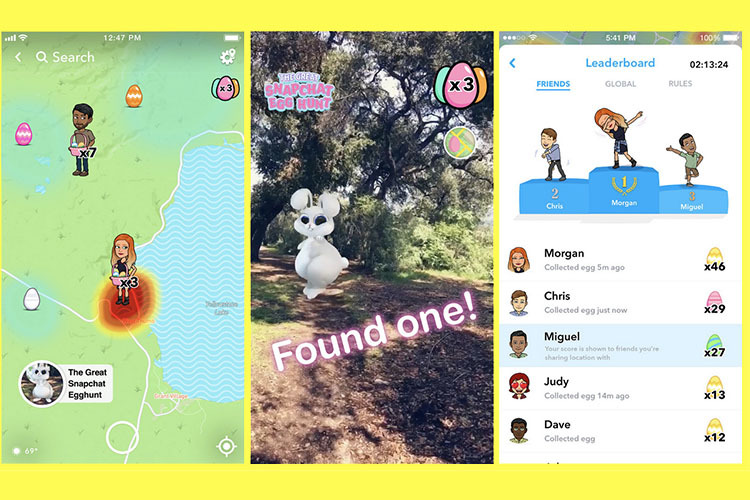 Unfortunately for Snapchat’s global user-base, the easter egg hunt is only live in US and Canada, so if you’re anywhere other than these two regions you’ll sadly not be able to participate. The company is also pointing out that users participating in the easter egg hunt need not worry about their privacy since their location will only be visible to people they’ve shared their Snap Map location with. Plus, there is also a ghost mode, where users can go on egg hunts without revealing their location to anyone.